Pollo di Nozi is a reporter-in-training and the local super sleuth. She definitely has a nose for news but occasionally she does get things a little bit muddled up. Just as well her heart is in the right place. 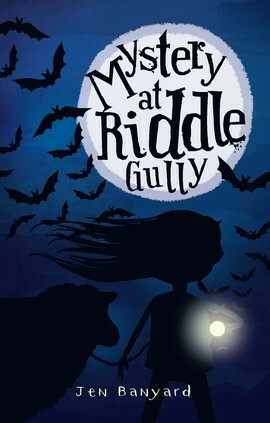 Pollo can smell a major scoop from a mile away and when strange things start happening in Riddle Gully, Pollo can’t resist the challenge to solve it. With Shorn Connery, her sheepish sidekick pet by her side, Pollo is determined to track down the Graffiti Kid. Mystery at Riddle Gully is not just another mystery story. It’s fast-paced and funny, packed with action, false leads, adventure, mystery, and the fight for an endangered animal species. It was quite spooky at times but Pollo is brave and charming. Jen Banyard has extensive Teaching Resources that support this novel engaging learning about English Language, Literature and Literacy. The notes also suggest that the book can be used as a springboard for discussion about family relationships, endangered animals, journalism, vampires, local government, and the understanding that people are not always as they might at first appear. This is Jen Banyard’s second book and it’s a well-written, humorous and suspenseful read for young fiction readers (10 – 14 years). I thoroughly recommend this book! Neridah McMullin is the author of three books for children. Her latest book is an Indigenous folklore story called 'Kick it to Me'. It’s an ‘aussie rules’ story that’s being endorsed by the Australian Football League. Neridah loves family, footy, and doing yoga with her cat Carlos (who also just happens to love footy).